SoftPlanet makes it possible for everyone to get free SysConfig download directly from our servers. There is no registration needed for downloading. Most of you do not even have a clue about what your computer has on the inside and how it performs. SysConfig 1.0 can give you such an idea about that if you are really interested. This program is a software tool, which can be used absolutely free of charge and as many times as you want on as many PCs as you like. It can assist you when you install products, optimize computer performance and troubleshoot your system. SysConfig works with any Windows version from 2000 up to Windows 8 and at the same time supports both 32-bit and 64-bit versions of these operating systems. There is no help file, language selection or any settings or preferences options. This is because the main goal of such a type of a software program is to monitor computer hardware in real time and detect software changes dynamically. SysConfig has a very simple and straightforward user interface. Seven tabs on top complete the possible options you have to explore in this product. 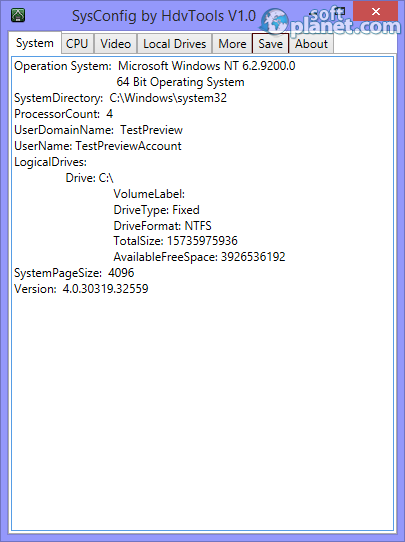 The System tab gives you general information about your operating system, CPU core count, user domain name, logical drives, etc. 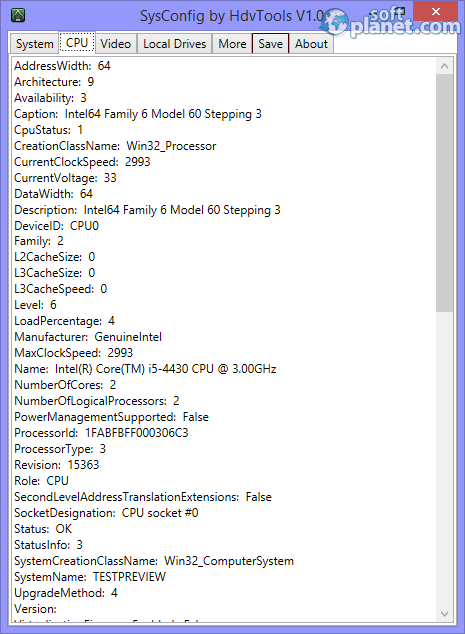 The CPU tab is directly oriented to all the specific parameters of the processor your computer uses. The Video and the Local Drives tabs do the same but for the video adapter and its drivers and the hard drives which you have mounted in the computer. There in nothing much you can do with SysConfig but to read and analyze the received data. 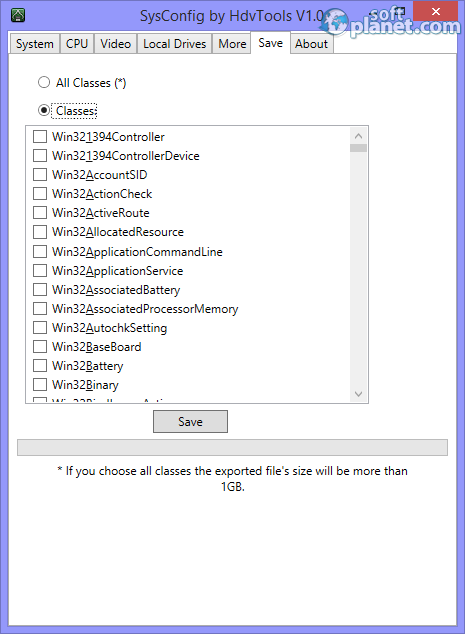 The only task you can do is save one or more of the listed classes, which are shown in the list, as a text file. SysConfig 1.0 is not a program for those of you who do not know how to use it. Even if you can install it you may not see real use for it. But for the users who look for a complete and advanced PC audit and inventory software application – this is the right tool. 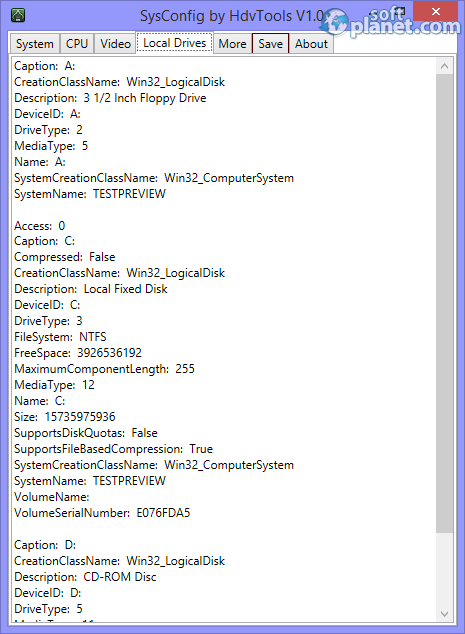 Our security scan shows that SysConfig is clean from viruses. The current version of SysConfig has been scanned by our system, which contains 46 different anti-virus algorithms. That ensures that SysConfig 1.0 is 100% safe for your computer.